Two sea lions died accidently at Bonneville Dam this week after a trap used to remove the aquatic mammals from the dam malfunctioned. According to Oregon Department of Fish and Wildlife (ODFW), the accident occurred either Tuesday or Wednesday. The door used to close nine sea lions malfunctioned, confining the lions for hours. According to ODFW spokesman Rick Hargrave, both the lions were likely crushed to death by a 1,500-pound Steller sea lion that was almost three times their size. Four traps at the dam are operated by the state fish and wildlife department as part of a program to pit off sea lions from preying on endangered salmon and steelhead. The dam poses an obstacle for spawning fish, making them an easy target for the massive carnivores. 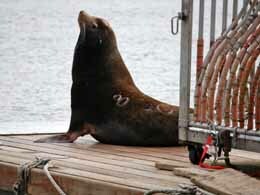 During the height of the spring Chinook runs, sea lions hop on and off the trap platform frequently. Hargrave said that the electromagnetically operated doors are typically left open at night. However, this time the trap door malfunctioned when a wire came loose from the battery that operates one of the traps. This caused the door to close and locked nine sea lions the animals inside about 3:45 am on Wednesday. According to ODFW's incident report, an exam on the two dead sea lions revealed, 'diffuse hemorrhage, very pale organs, and consolidation of the lungs'. The report states, "These findings are consistent with asphyxiation and severe internal bleeding, and suggest the sea lions were crushed by one or more of the larger animals". Hargrave added that his agency hopes to have the door on the trap repaired to resume trapping sea lions again next week. Agency workers will inspect all trap doors and test battery wires and connections. All battery connections will be tightened before the traps are set.